This post is sponsored by Goldfish Swim School. Is it a tradition in your home to get a photo with Santa every year? It is for us 🙂 There are many different places to find Ole St. Nick around the Waukesha County and Lake Country area of Wisconsin willing to snap that picture perfect moment in time. Or is it a tradition for your family to have breakfast with Santa? The Breakfast with the reindeer in Delafield is a fan favorite! Check out Lake Country Family Fun’s Photos With Santa Guide to find an event near you. More events will be added as they are announced! *To view the Santa events in calendar format, click here. This list is copyright, Lake Country Family Fun. It is not for reproduction or re-distribution. Please link to this article for distribution purposes. Thank you! Stay in your PJ’s and join the Brookfield Square Mall for a festive Santa Arrival Pajama Party to welcome Santa to Brookfield Square on November 10! Come see Santa in his Old Caboose prior to the Hartford Christmas Parade on November 10, 2018. The 2nd Annual Feztival of Trees at The Tripoli Shrine Center 3000 W. Wisconsin Ave., Milwaukee is here! November 17 – 24, 2018. Come see Santa in downtown Menomonee Falls on Saturday, November 24 before the Tree Lighting. Santa will be at The German Christmas Market in downtown Oconomowoc on their Village Green. More details on the German Christmas Market here. Santa is coming to Mullen’s Dairy Bar in downtown Watertown! Tuesday, December 11, 6 to 8 p.m.
Come see Santa at the Johnson Creek Outlet Mall. Please bring your own camera to take a picture with Santa. 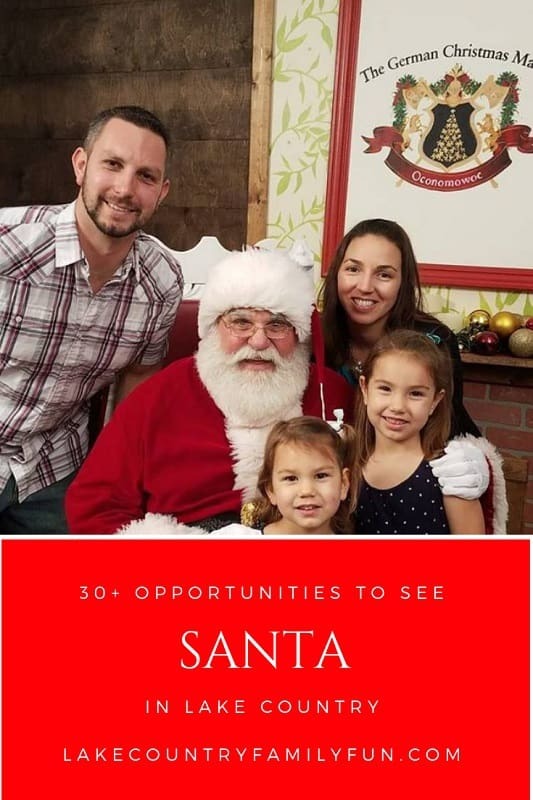 Come to Roots Coffee Bar an Cafe in downtown Waukesha Saturdays from November 24 – December 22 from 1:00 – 4:00 pm for free pictures with Santa. Join for a visit from Santa at Ruckus and Glee. Santa’s elves gave us the message that Santa is stopping by Ruckus & Glee for 4 hours on the day after Thanksgiving! AND THIS SANTA DOESN’T CHARGE FOR PICTURES! Visit with Santa and Mrs. Claus in downtown Muskego on November 24. Come to downtown Hartland to see Santa and the tree lighting at 6:30 pm on Friday, November 30. Bring your family to Summit’s Holiday Cookie Decorating and Craft Fair at Aurora Summit on December 1. Come say “Hi!” to Santa and his elves. Make an Old World Christmas part of your family tradition this year! Guests will encounter figures from Christmas stories, like St. Nicolas, Jultomte, Krampus, and, of course, Santa Claus. This event occurs on the first three Saturdays and Sundays in December. Santa makes an appearance to this festive celebration on Saturday, December 1, 2018. Find Santa and Mrs. Claus at the library. Photo opportunities will follow story time. The festival this year will host Santa, make and take projects, face painting, photo booth, caroling and snacks. 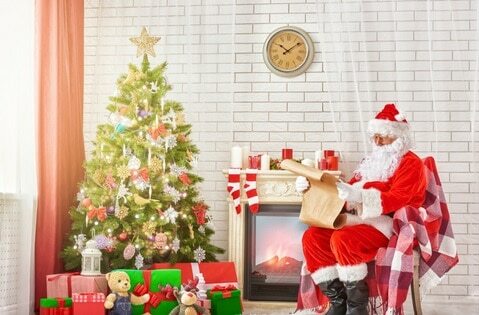 Santa will be present from 10:00 am to 11:00 am on December 1. Come have cookies with Santa on December 1! Bring your camera or buy photos with Santa for a nominal fee. 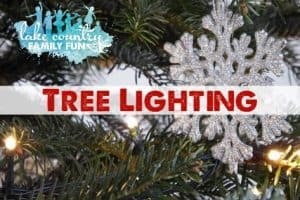 Santa and Mrs. Claus will be arriving via fire truck to the Pewaukee Tree Lighting where you can take pictures with Santa with your own camera on Saturday, December 1. Come get your pictures taken with Santa at Midnight Magic in Mukwonago on December 1. Santa is going to be at the Apple Barn Christmas Party in Elkhorn on December 1! Bring the kids to get their picture taken with Santa during the day (he will be here from 10am – 1pm), then come back later (without the kiddos) for some after hours fun! Santa will be at various Fox Bros. Piggly Wigglys on Saturday, December 2. Santa is coming to the Okauchee Fire Department on Sunday, December 2 from 1:00 pm – 3:00 pm. Sit on Santa’s lap and tell him what special gift you’re thinking of this year! It’s a perfect time for holiday photos. 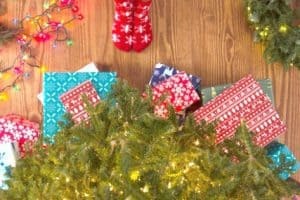 On December 2, skip the holiday shopping mall madness and join the Friends of Boerner Botanical Gardens for a relaxed morning at the Holiday Gift Fair with Santa—browse unique, high quality gifts for sale from dozens of local artists and crafters, and enjoy seasonal children’s make-and-take crafts, musical entertainment and FREE holiday fun for the whole family. Please join the Oconomowoc Area Historical Society & Museum for their third annual visit of Santa Claus and his elves at the Oconomowoc Historical Society on December 2. Santa Claus will help everyone enjoy activities, games, cookies, coffee and cocoa all in the wall of the decorated historical museum! Santa is coming to the Roost Mercantile in Pewaukee on Sunday, December 2 from noon to 2:00 pm. Your children will be able to sit on Santa’s lap, while you take pictures with your own camera. 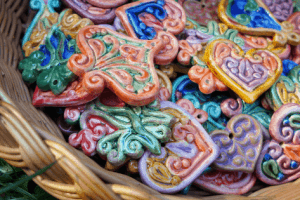 Redeemer United Church of Christ in Menomonee Falls will be hosting its annual Christmas Cookie Sale on December 8th. Homemade cookies, homemade candies, and gluten free options will be available for sale. Come for pictures with Santa and crafts for children. Please join the Merton Community Fire Department for a FREE Family event: Cookies & Cocoa With Santa and the Mistletoe Market on December 2! Santa is coming to Silly Willyz on Sunday, December 2 for free pictures with your little one or family. Join in to see Santa and Mrs. Claus at Old Falls Village Sunday December 2nd for the 51st Anniversary of the Silver Tea. Santa is coming to Dousman on December 2nd. Santa is coming to the Town of Brookfield, specifically, the Corners of Brookfield on December 5. Come see Santa at the North Lake Tree Lighting event on Friday, December 7th! Bring your Kids and Pets for free Photos with Santa at Wisconsin Harley Davidson in Oconomowoc on Friday, December 7 from 4-6 pm or Saturday, December 8 from 11-2 pm. Friday is specifically for pets; Saturday is not. Santa Cares at the Brookfield Square Mall is a sensory-friendly Santa experience for your child. This event will be held on December 8th. Get your photos with Santa at Christmas in the Depot on December 8th. Santa is ready for his annual beard trim at Snips and Giggles at Holiday at the Avenue Square in downtown Oconomowoc on December 8. Santa will be at the Waukesha Library during their holiday storytime on Saturday, December 8. Come to Redeemer United Church of Christ in Menomonee Falls for pictures with Santa and crafts for children on December 8. Santa will be in his workshop at Christmas in Wales on December 8. Mark your calendars for a magical journey to the North Pole on December 8! This tri-community event will be held at the Grafton Fire House, 1431 13th Avenue. Activities include caroling, cookie decorating, trolley rides, train display, letters to Santa, making of “reindeer food”, photos with Santa and Mrs. Claus. Make a memory with HAWS and Petco on December 8th! Help pets in need in our community: for a $9.95 donation you’ll receive a digital keepsake photo and the joy in knowing you’re supporting HAWS’ lifesaving work, thanks to the Petco Foundation. Santa, Mrs. Claus & Rudolph are coming to the Domes on December 9 and 15th from noon to 3:00 pm! Santa is stopping by the Oconomowoc Farmers Market on Sunday, December 9 from 10:30 to 11:30 am! Visit with Santa in Big Bend at the Big Bend Lions Club on Monday, December 10th at 6:30 pm. This is a very popular event. Santa and Mrs. Claus will be at the Butler Public Library on December 13 from 6:30 pm to 8:00 pm. The annual open house is Thursday, December 13th from 5:00pm-8:00pm! Bring your children, your neighbors children, and your cameras as our Santa is NOT SCARY!!!! Invite your family and friends! Santa will be making an appearance at the Children’s Play Gallery in downtown Oconomowoc on Friday, December 14 at 9:30 am. Not Santa, but Santa Cow will be at the Chick-fil-A at Brookfield Square on Friday, December 14. Visit Highland Ridge Stables and get your picture with Santa and all his horsey friends on Saturday, December 15th from 11:30 am to 1:30 pm! Pony Rides, Hot Cocoa, view riding lessons, and awesome lesson packages at a holiday discount! Purchasers MUST be present at Highland Ridge in order to receive holiday deals! Santa will be visiting the Chris R. Lueth Agency, Inc. – American Family Insurance Pewaukee office on Saturday, December 15 from 9:00 am to 11:00 am. Santa is coming to Burn Boot Camp in Sussex on December 15. Ages 5-9, enjoy a fun-filled morning with Santa as they snap a few photos, get a quick workout in with Mr. Brandon, enjoy smoothies (compliments of elite nutrition) and a goodie bag on the way out the door! Photos will run from 10:15-11:15; please have a phone or camera to snap your shot with SANTA! Have other kids but they are not camp ages? Feel free to bring them for a photo, but childcare will NOT be provided while camp runs. Camp will run from 11:15-12 with Mr. Brandon. On the way out the door, grab your smoothie from elite and other special goodies!! $10 for first child; $5 for each child after. All proceeds will be donated to charity. $5 for any additional, non-camp-aged child who would like a smoothie and goodie bag; if they just want to take a photo, that’s fine, no cost, but Burn Boot Camp will let you handle the explanation. Parent/Grandparent must accompany child for duration of camp. Burn members only. YOU MUST PRE-REGISTER/PAY by Friday, Dec 14th. No exceptions. Come to Stories with Santa at the Hartland Library on December 15. Santa Claus is coming to the Brookfield Regency on Saturday, December 15! Join in between 10:00 am and 11:30 am for ornament making, photos with Santa, hot chocolate and cookie decorating! Come ice skate with Santa at the Mullett Ice Center in Hartland on December 22. Come take your picture having an ice cream cone with Santa! He will be at Here’s the Scoop from 11:00 am to 2:00 pm on December 22. Bring the whole family out for a fun day! Kids will love meeting Santa’s amazing flying friends, and parents can enjoy the wonder on their children’s faces as they greet real, live reindeer (Blitzen was in Delafield last year!) from Reindeer Games in nearby Hartford, WI. Guests are encouraged to bring their camera to photograph loved ones with Santa, live reindeer and a magical Elf or two! Kick off your holiday celebrations with Breakfast with Santa and a Holiday Craft Fair Saturday, December 1 at KMHS. Santa Claus is coming to town! Make your plans now to join us for holiday cheer and wintery celebration as Santa and Mrs. Claus make their annual trip to the Milwaukee County Zoo. Advanced tickets required. December 1-2, 8-9 & 15-16, 2018. Enjoy a family style breakfast and a chance to take photos with Santa when you join Agape Community Church for their second Breakfast with Santa event on December 2, 2018. Breakfast will include pancakes, sausage, scrambled eggs, hashbrowns, muffins and fruit. Make sure to bring your camera! There will be plenty of opportunities to snap that special picture while making some great family memories among great community. The cost of this event is $5 per adult, $3 per child…Max of $20 per family. Proceeds go towards supporting Agape’s Acts Of Kindness (AOK) events. SPACE IS LIMITED and RESERVATIONS ARE REQUIRED!! Register HERE. Come have breakfast with Santa at the Pabst Farms YMCA on December 8. Choose 8:00, 9:15, 10:30 or 11:30 am. Register by December 1st, 2018. Join in for the 8th Annual Sons of the American Legion Pancakes with Santa event on December 15th at the Flanagan Dorn American Legion Post in Hartland. This event draws hundreds of families from the Lake Country area to support the SAL mission and local Hartland Legion. Santa’s elves have told SAL members he will be arriving at 9:00 a.m. – bring your camera to take your photos. SALS will not be providing photos. Pancakes will be ready for eating at 9:00 a.m. for $5.00 a plate. Come have breakfast with Santa in downtown Oconomowoc at the Cornerstone Pub and Eatery on Saturday, December 8th. Seating will be at 8:30 am and 10:00 am. More details will be coming here. Enjoy breakfast with Santa on December 16! $5 of each brunch will be donated to the Christmas Clearing Council of Waukesha County. Santa is coming to A.J. O’Brady’s in Menomonee Falls on December 8, 2018. The Main Mill is co-hosting. Come have lunch, give him your list, and take a picture. Santa’s breakfast workshop will be at Martha Merrell’s Books again this year! Enjoy some hot breakfast, juice, cookies, and of course coloring and arts and crafts with Santa himself! Must place a reservation in advance. Events fill up. Come have brunch with Santa on December 16. There will be a visit from Santa in front of the fireplace from 11AM-1:30PM and a cookie decorating station for the kids. Ring in the holiday spirit for the Annual Santa Brunch. Santa will be making a stop at our Plantation Banquet Hall on Sunday, December 16th from 10:00am until 2:00pm. **And don’t forget to bring your camera to capture those special moments! Come have brunch with Santa on December 22 at The Corners of Brookfield. More details to be announced yet here. Santa and Mrs. Claus plan to make an appearance at the downtown Waukesha tree lighting event. Meet Santa & his reindeer, here from the north pole, on November 17. Santa arrives via fire truck just prior to the Pfister tree lighting on November 23. Escape the hustle and bustle of the season and enjoy a storytime featuring seasonal stories with Miss Kathy, followed by a visit from Santa and cookie decorating. December 8 at 10 am. Visit with Santa on Saturday, December 1 at the Habitat Waukesha ReStore. Suggested donation of $5 for a photo with Santa. Santa will be making an appearance at the Sussex Tree Lighting on November 30. Visit with Santa after the parade on Saturday, November 24. 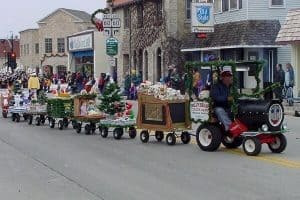 The West Allis Christmas Parade is an annual holiday tradition, and a favorite night-time Christmas parade in Southeast Wisconsin! Enjoy marching bands and live performers, creative floats and vintage vehicles, meet elves, cartoon characters, and of course, wave to Santa Claus himself at the end of the parade! On December 1, see Santa as the final entry in the Christmas Parade. 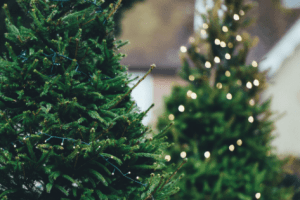 Santa will make an appearance at the Village of Merton Tree Lighting on December 4. 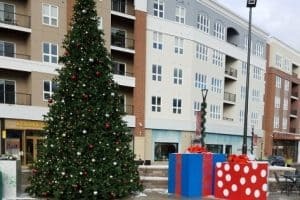 Santa will make an appearance at the Brookfield Village Tree Lighting Celebration on December 6. Come see the Canadian Pacific Holiday Train come through Hartland and Oconomowoc, carrying Santa Claus! Santa will be at the Lannon Tree Lighting on Friday, December 7th. Come paint with Santa at Set Apart Art Studio in Watertown on Saturday, December 8. Skate with Santa on December 22 from 1:30 pm to 3:00 pm at the Mullett Ice Center in Hartland. DID WE MISS A SANTA OPPORTUNITY? If you are organizing a photo with Santa event in November or December and you would like it added to this list, please email us at erin@lakecountryfamilyfun(dot)com with your Santa photo opportunity information. You can also email us via the contact form below. 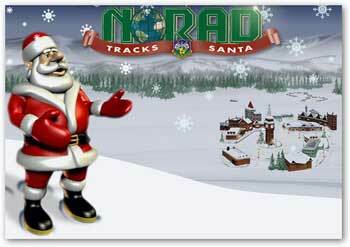 Be sure to track Santa on Christmas Eve as he makes his way to your house! Did we miss a photo opportunity? If you are organizing a photo with Santa event in November or December 2017 and you would like it added to this list, please email us at erin@lakecountryfamilyfun(dot)com with your santa photo opportunity information. You can also email us via the contact form.